He was brilliant — This first statement might seem a little obvious. He invented the thermionic valve so he has to be brilliant, right? John Ambrose Fleming is mostly recognized for his work with thermionic valve, but after staring at his handwritten notes for several hours, I can tell you that I only understood about ⅓ of what he wrote. His notebooks were filled with equations and experiments regarding the thermionic valve, as well as his other interests, including spark gaps and deep sea waves. Most of the reason that I had difficulty deciphering his notes probably comes from the fact that I am in no way a scientist. Social science major over here folks! It could be really interesting to have a more scientifically gifted mind take a look at these documents in order to actually let you know just how brilliant he is. Or you could take a gander at some of his numerous published works. You can even take a look at 31 patent records from John Ambrose Fleming here and judge for yourself. 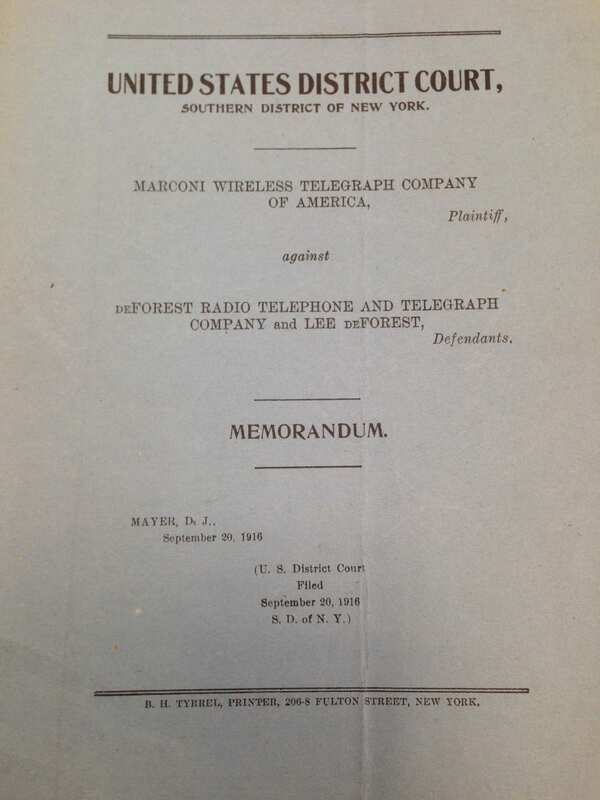 Cover of the legal memorandum from the Marconi Vs DeForest case. (Image provided by UCL Special Collections Library). 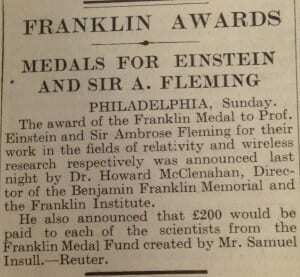 He kept a close eye on what others were doing — While looking through the boxes of material, several folders were dedicated to holding the patents of other inventors from England and the United States. All in all, I looked through over 100 different patents, not including duplicates. He separated these patents into two sets, one regarding light bulbs and another one about thermionic technology. The earlier patents date back to the 1880’s, but Espacenet (The European Patent Office Website) mostly has digital records dating to the 1890’s, which makes these hard copies even more valuable when it comes to research. There is also information regarding the conflict and legal battle between Fleming and Lee DeForest. Two years after Fleming invented the thermionic valve, an American named Lee DeForest created his own valve, which he called the Audion. The Audion used the same technology as Fleming’s valve, except for one thing, he added a third electrode, making his device a triode, while Fleming’s was a diode. Fleming’s disputed the originality of this device and the Marconi Company eventually took the issue to court. 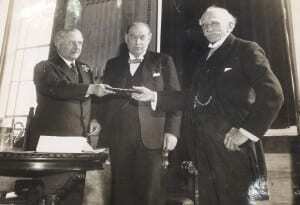 In the end, the court sided with De Forest , and also refused to grant an extension on Fleming’s patent in 1918. Today, DeForest’s Audion is still considered a significant discovery that helped propel the world into the age of radio. 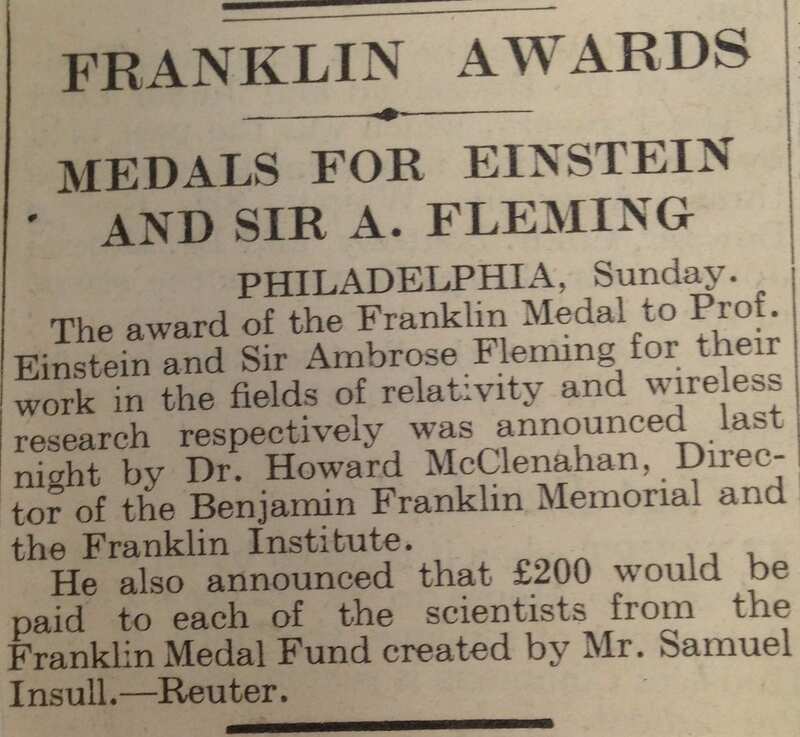 Newspaper clipping saved by Fleming giving details on the award of the Franklin medal. (Image provided by UCL Special Collections Library). He liked to keep everything— So as I mentioned in the beginning, I went through all 24 boxes of the Fleming Collection. That is a lot of information to look at, and some of it seemed a little repetitive for my research purposes. If my goal had been to look at all the newspapers that mentioned the Fleming valve, then I really would have hit the jackpot! Although it did seem like I needed to sift through a lot of material that didn’t directly apply to my research, I had a lot of fun doing it! I got to read parts of conversations that Fleming had and see which institutions he worked with. 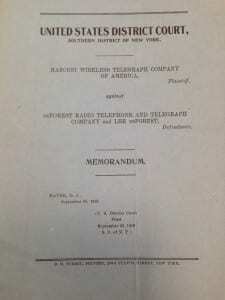 I had the opportunity to handle original handwritten documents from Fleming, Guglielmo Marconi, and Lee Deforest. And best of all, I found some documents that actually applied to my research! Success! It’s not everyday that I am given the opportunity to handle primary documents, let alone some as significant as the ones in the Fleming collection. In my opinion, he may have gone a little overboard with his collecting, but if he hadn’t, I might not have had the documents I needed! All in all, my experience with the UCL Fleming Collection was a really interesting and informative experience. I was given the chance to take a closer look at Fleming’s personal and professional life and learn a little bit more about how the Thermionic valve came about. It was a really great opportunity for me as a student, and will help aid me along in my academic career as I begin to dig into research for my dissertation and beyond! Kelsey Svaren is a Museum Studies Masters student based at the Institute of Archaeology.